Early pilots navigated visually, following highways and railroads and looking for familiar landmarks. To help pilots, Charles Lindbergh campaigned for cities to paint the name of their town on the roof of any large building. Corvallis Boys Scouts took up this challenge and, with the help of a local painting contractor, painted the roof of OSU's McAlexander Fieldhouse with a large Corvallis sign and an arrow pointing to the Grant Street airport a mile to the northeast. 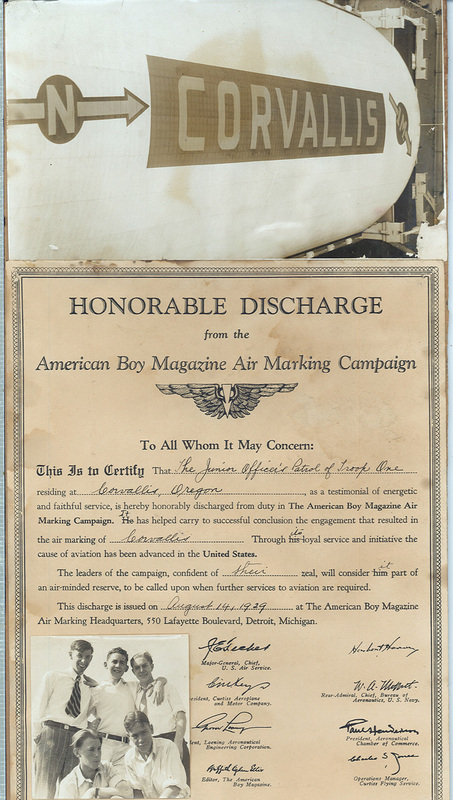 For their work, the Scouts received a certificate from the American Boy magazine. In the front row are scouts Harold Merryman, Sterling (Mike) Chamberlain; in the back are Assistant Scout Master John Irvine, and scouts Carl D. Merryman and Frank Merrill.